For Elvira, the heroine of Verdi’s rousing early opera, it’s a classic example of too much of a good thing—love, in this case. She’s passionately involved with the handsome bandit Ernani (actually an aristocrat), who returns her affections. But the king of Spain also wants her, as does her elderly guardian. 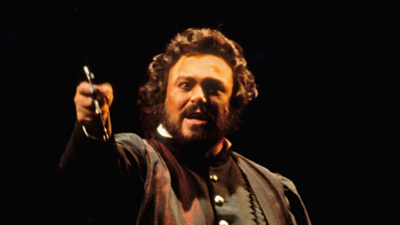 When it comes to great singing, however, there is no such thing as too much. The legendary pairing of Leontyne Price and Franco Corelli, at their thrilling, impassioned best, was an operatic match made in heaven. 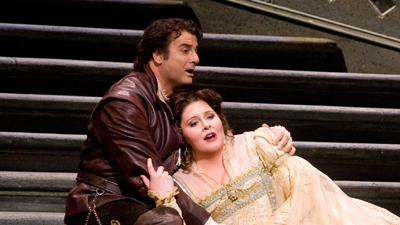 They star opposite Verdi baritone Cornell MacNeil and refulgent bass Giorgio Tozzi. The brilliant Thomas Schippers presides in the pit.